Sign up for the closed Alpha test on our homepage to be among the first to play and create cards in Collective! 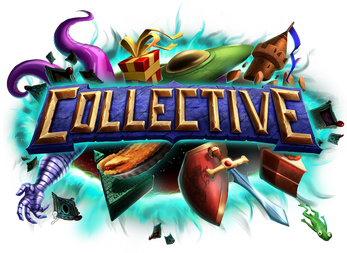 Collective is the first competitive strategy card game where players have direct control over the effect, appearance, and balance of all the cards in the game. Create any card you can imagine using the Card Editor. Once you're happy with it, post the card to our Subreddit. Each week the top 10 posts are added to the game permanently, for everyone to play with. No Packs, No Lootboxes Collective is free-to-play. If you choose to spend money, you'll always know exactly what you're getting. Play as a Hero Build your deck around a Hero and reap unique benefits throughout each game. Inspired by games like Dota, Heroes gain experience throughout each match and grant a powerful effect each time they level up. Draft In Game Every time your hero levels up, you choose a new card. Yours to keep, and play immediately! Card Blueprints Unlock a card blueprint once, and you have access to unlimited copies of the card forever. No more fretting over which cards to dust! Simultaneous Turns Out-think and out-plan your opponent on your way to victory, and players spend less time waiting around!